The 8th Tourism Promotion Organization for Asian-Pacific Cities (TPO) Forum opened in HCMC on June 21. 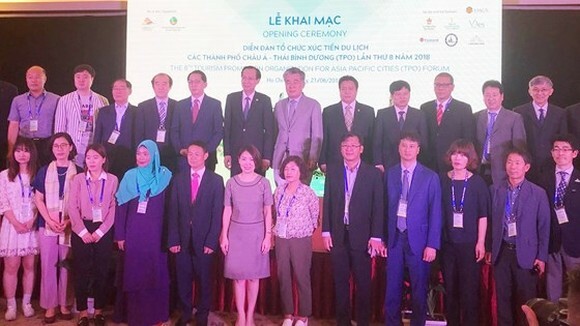 Attending at the event were Deputy Standing Chairman of HCMC People's Committee Le Thanh Liem, Vice Chairman of the Hanoi People's Committee Ngo Van Quy, TPO Secretary General Shin Yeon-sung and delegates from cities and industrial businesses of TPO member countries. This year’s event themed ‘Smart tourism” aims to discover initiatives and strategies to promote the development of the tourism sector amidst the fourth industrial revolution as well as improve technical capabilities of TPO members. Speaking at the opening ceremony, Deputy Standing Chairman of HCMC People's Committee Le Thanh Liem stressed that Ho Chi Minh City is one of the biggest tourist centers in Vietnam. The number of international visitors coming to the city has accounted for around 50 percent of the total foreign tourist arrivals in the country. The municipal tourism sector has contributed 30 percent of the total tourism revenue of the country and 10 percent of the city’s GRDP (Gross Regional Domestic Product). He hoped that the forum is a chance for member countries to exchange cultural values and develop relationships and cooperation as well as approach communications and IT application solutions to develop the tourism industry. Delegates discussed about building smart city connecting with smart tourism, challenges and solutions for smart tourism technology, the ecosystem structure of smart tourism and introduction of smart tourism models of cities, HCMC, Fukuoka of Japan, Boryeong of South Korea, Kota Bharu of Malaysia. The event also includes sideline activities, such as TPO Travel Trade, smart tourism discussion, a survey program of HCMC’s destinations from June 21-23. Held every two years, the Tourism Promotion Organization for Asia Pacific Cities is an international tourism organization for the networking of inter-city cooperation and development of the tourism industry in the Asia Pacific region. Presently, TPO has 86 member cities and 45 industry members from countries in the Asia Pacific region.